With rising population growth and increasing demand for resources, surface water is being redistributed and artificially managed to the extent that there are few pristine river basins left today in populated regions without the strong human footprint caused by water diversions, barrages, dams and irrigation projects. The current reality is that in these populated regions of the world, it has become intractable to have accurate knowledge of the management component of water for physically predicting the surface water component of the human-impacted water cycle. The hydrologic community now eagerly anticipates the proposed Surface Water and Ocean Topography (SWOT) mission as a unique pathfinder to understand the changing patterns of human-altered water cycle over land that we now call the 'Anthropocene' of water. Similarly, the applications community hopes for improved water management afforded by SWOT measurements over managed river systems lacking in routine in-situ measurements. To understand and advance SWOT-observation based surface water flux estimation (river/reservoir discharge) through simulator-based experiments in Monsoon-driven Asian (large) river systems. (Ganges, Brahmaputra, Indus and Mekong and Red Rivers) (see Figure 1). To advance the application potential of SWOT observational capability for water and disaster management through close proactive engagement with stakeholder water management agencies. Figure 1. Left panel – representative study regions to be used or already under investigation by the PI for advancing SWOT data product development with simulator and real data experiment; Right panel – mass balance concept and use of SWOT observables to derive reservoir's dynamic behavior. Figure 1. Top panel – representative study regions to be used or already under investigation by the PI for advancing SWOT data product development with simulator and real data experiment; Bottom panel – mass balance concept and use of SWOT observables to derive reservoir's dynamic behavior. 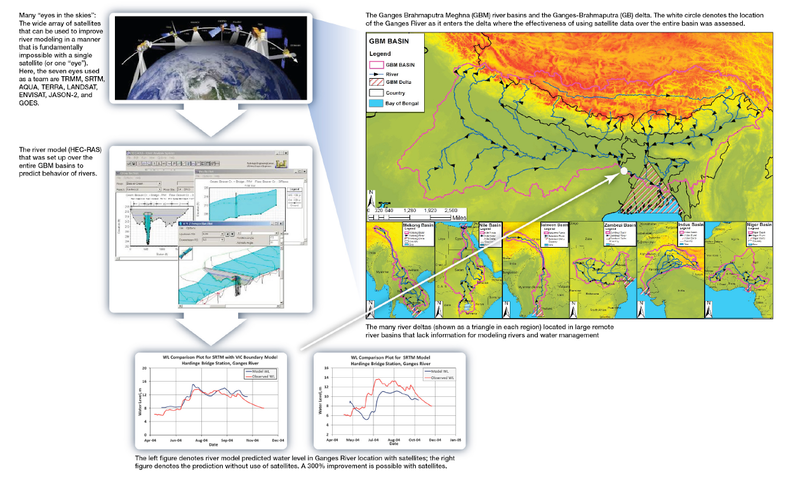 We are currently applying the SWOT hydrologic simulator over continental scale river basins such as Ganges-Brahmaputra and the Mekong rivers. For these river systems, a comprehensive hydrologic model (the Variable Infiltration Capacity –VIC) and/or HEC RAS Hydrodynamic (HD) modeling capability now exists in the PI's group. For the case of Mekong in particular, we are focused on studying the behavior of reservoirs to understand how well SWOT, with existing sensors, can monitor storage change, outflow and derive operating rule curve. Through the use of the simulator, we plan to dissect SWOT's accuracy of monitoring fluctuations of river level and width and its sensitivity to discharge algorithms. Ways to assimilate SWOT observables (from simulator) into a hydrodynamic and hydrologic model to improve simulation of flow, river level and reservoir dynamics will also be explored. This will then help us understand how we can use SWOT data to predict the hydrologic impact of current and planned reservoirs in the Mekong and around the world with similar hydraulic features. Finally, the issue of how best to create a floodplain DEM is crucial for SWOT as a goal, that this project will tackle using the floodplains of Mekong, Ganges and Brahmaputra rivers as case studies. By working closely with the SWOT Application Working Group (SAWG) (as Application Lead), we plan to build engagement with the application community and develop an array of early adopters for water management user community. First, we will continue our leadership efforts with other members of SAWG to hold frequent applications workshop at ST meetings. We plan to create lesson plans and tutorials on how SWOT can advance hydraulic/hydrodynamic modeling as well as water management using extensive data from the SWOT hydrologic simulator. Given the recently acquired expertise of the hydrologic simulator and its successful application in Ganges and Mekong river systems (Bonnema et al., 2016; Bonnema and Hossain, 2017), significant amount of tutorial material of varying levels can now be created to systematically build demand for SWOT data for water management. We plan to seek collaboration with SWOT Deputy Program Assistant (DPA) Margaret Srinivasan and Amita Mehta of NASA ARSET training program. 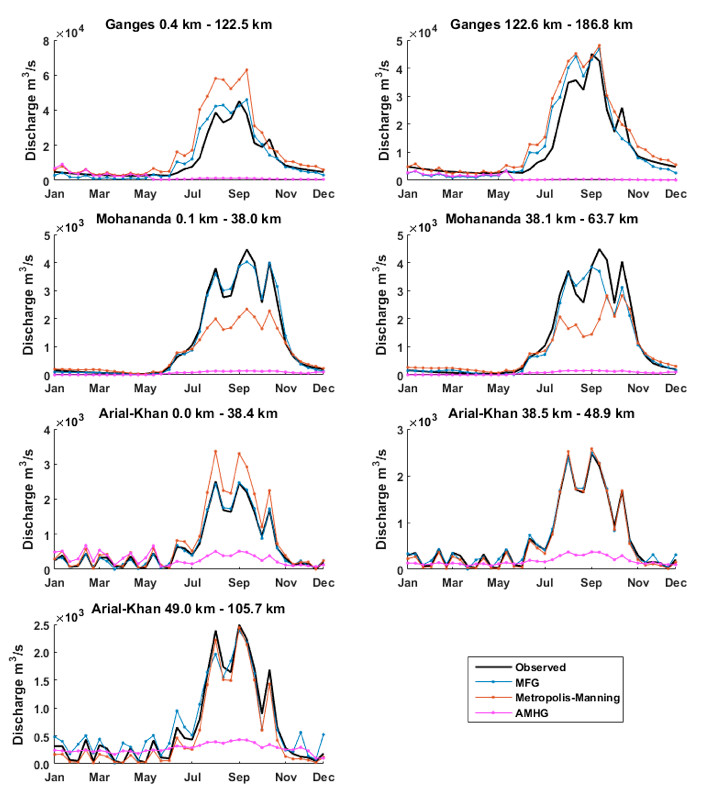 The dramatic difference between wet and dry season streamflow in the tropical monsoonal basins of South Asia provides a unique challenge for SWOT based river discharge estimation algorithms. We have performed a comparison study between three such algorithms, tailor made to estimate discharge from SWOT observables: At-Many-Stations Hydraulic Geometry (AMHG), Mean Flow and Geomorphology (MFG), and Metropolis Manning (MetroMan). We applied these algorithms to three rivers in the Ganges Brahmaputra Basin. A calibrated HEC-RAS hydrodynamic model of the delta was used as both a source of SWOT observables (river height, width, and slope) and as a reference for which estimated discharge was compared. The algorithms were run using these reference observables, providing an assessment of the algorithmic uncertainty in each method. The SWOT Hydrologic Simulator was then applied to the modeled water surfaces, and observables derived from the simulator output were input into the algorithms (Figure 2). 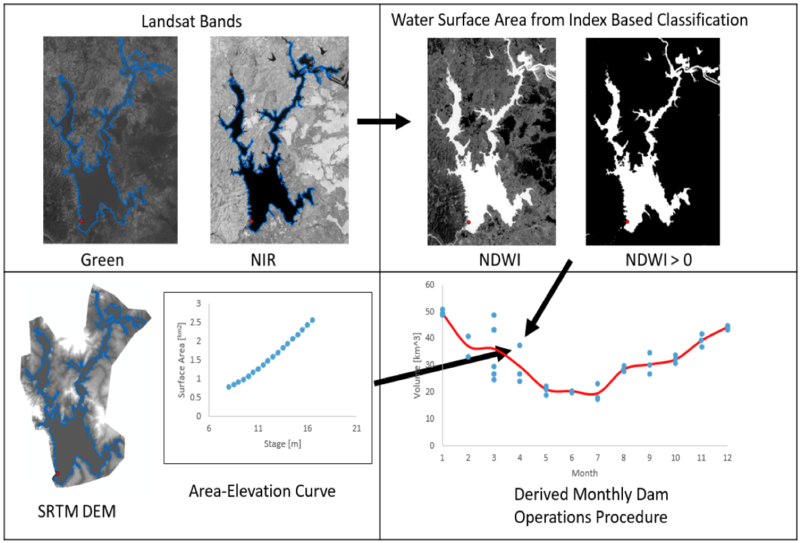 This set of river discharge estimations provides assessments of algorithm performance under realistic conditions, where SWOT observational errors propagate. Figure 2. 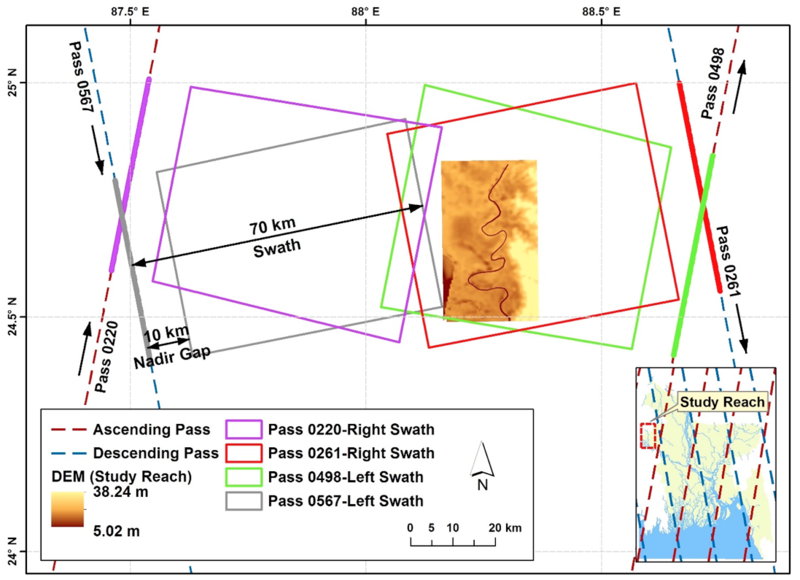 Left panel – Map showing location of study river reaches as well as HEC-RAS model cross section locations and calibration stations; Right panel – SWOT Hydrologic Simulator application over the Mohanada River. Figure 2. 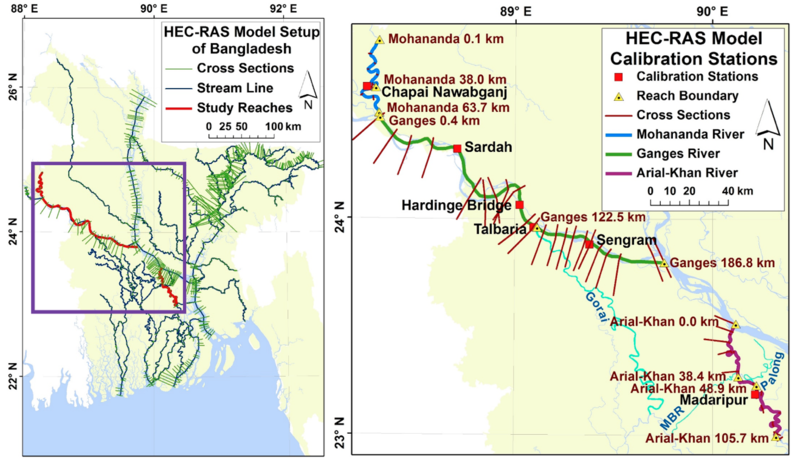 Top panel – Map showing location of study river reaches as well as HEC-RAS model cross section locations and calibration stations; Bottom panel – SWOT Hydrologic Simulator application over the Mohanada River. Figure 3. Comparison between modeled discharge (reference) and algorithm estimated discharge for each river, separated into sub-reaches. The results of the algorithmic uncertainty assessment (using reference observables) are shown in Figure 3. MFG provided the most consistently accurate discharge estimates, followed closely by MetroMan. AMHG performed well in the dry season, but failed to capture wet season peak flows. However, accuracy was greatly improved through calibration with ancillary wet season flow data. For all river reaches, at least one algorithm estimate discharge with less than 50% RRMSE. With the introduction of simulated SWOT observational errors, discharge estimation accuracy experienced an overall slight decrease, with MetroMan exhibiting higher sensitivity to these errors. What emerges from these findings is that no singular algorithm is superior for river discharge estimation for these rivers, suggesting that a multi-algorithm approach may be appropriate here. The Mekong River Basin is experiencing rapid dam construction, which will severely alter surface water fluxes in the basin. We have developed satellite based techniques, using existing sensors, to monitor and study the impact reservoirs in the basin have on streamflow and the residence time of surface water. This method revolves around a mass balance on the water fluxes through a reservoir, between reservoir outflow, inflow, and storage change. Inflow is estimated using a calibrated Variable Infiltration Capacity (VIC) hydrologic model of the Mekong Basin. Reservoir storage change is estimated by pairing estimates of reservoir water surface elevation from a Jason Altimeter or estimates of reservoir surface area from classified Landsat images with an area-elevation relationship derived from Shuttle Radar and Topography Mission (SRTM) elevation data. Landsat data is occasionally corrupted by cloud cover. When this occurs, the missing data is replaced through averaging monthly reservoir volume derived from the long record of Landsat images available. We are currently developing methods for incorporating SWOT observations into this framework, based on simulated SWOT observations of reservoirs in the basin. The goal is to establish a multi-sensor method, which would improve our reservoir observational capacity beyond that of current missions or SWOT alone. Thus far, we have applied this technique to 20 reservoirs in the Mekong River Basin from 2001 through 2015. We found that residence time of each reservoir ranged from 1 month to 4 years, with higher residence time reservoirs on lower order tributaries. 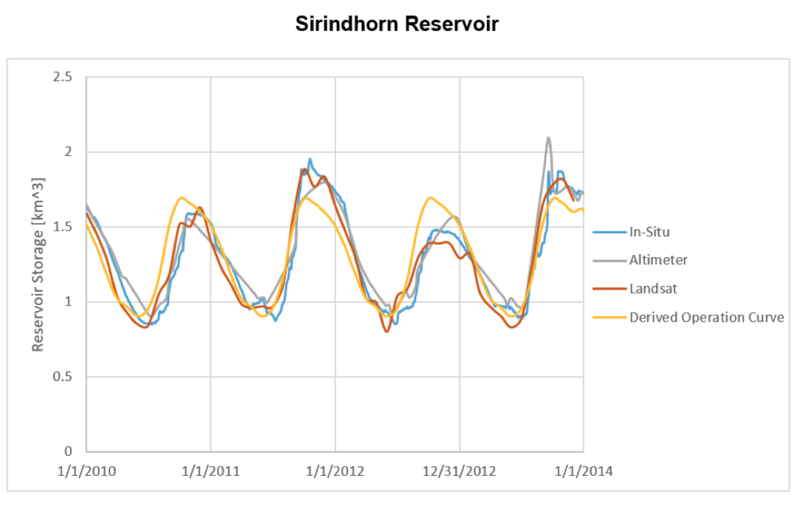 Overall, these reservoirs increased the residence time of surface water in the entire basin by only 3 weeks. However, when only considering the water that passes through these 20 reservoirs, the residence time increase becomes 4 months. Seasonal trends in residence time were also be detected by this method, with low residence time in the wet season and higher residence time in the dry season. Ultimately, this application of current satellite sensors highlights the capabilities of such techniques to provide valuable information regarding the impacts humans have on river systems through reservoir operations. Figure 4. Left panel – Process of estimating reservoir storage from Landsat image and approximation of reservoir operating policy from Landsat record; Right panel – Comparison between different reservoir storage estimation methods and in-situ reservoir storage for the Sirindhorn Reservoir in Thailand. Figure 4. Top panel – Process of estimating reservoir storage from Landsat image and approximation of reservoir operating policy from Landsat record; Bottom panel – Comparison between different reservoir storage estimation methods and in-situ reservoir storage for the Sirindhorn Reservoir in Thailand. SWOT data availability at a latency of less than 2 days has overwhelming demand and critical societal need wherein a compromise between accuracy and latency appears widely acceptable. While the availability of SWOT data in near real-time (NRT) will spur the most innovative societal applications and significantly improve many current operational applications, non-NRT data will remain valuable for retrospective (post-water event) analysis, large-scale basin planning, ecological management and policy formulation. The SWOT mission needs to engage with application community now to provide education and training on data, uncertainty, access for various levels of expertise among users (layman, beginners and advanced) and in multiple languages and format (in person, online, multi-media tutorials). Figure 5. 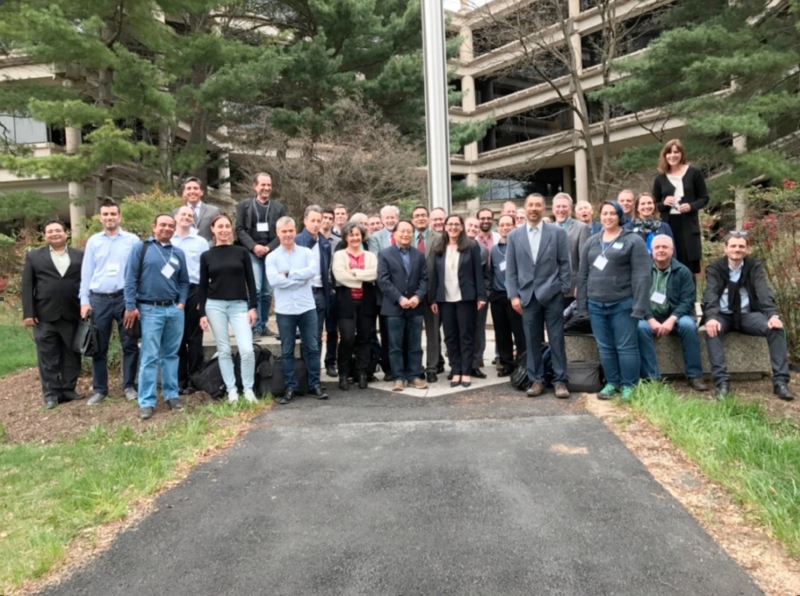 Group picture of participants at the 2nd SWOT Application User Workshop in USGS HQ in Reston, VA, taken on April 5, 2017. Bonnema, M., Sikder, S., Hossain, F., Bjerklie, D., Durand M., and Gleason, C. (2016). Benchmarking Wide Swath Altimetry Based River Discharge Estimation Algorithms for the Ganges River System, Water Resour. Res., 52, 2439-2461, doi: 10.1002/2015WR017296. Bonnema, M., Sikder, S., Mao, Y., Chen, X., Hossain, F., Pervin, I.A., Rahman, S.M.M., and Lee, H. (2016). 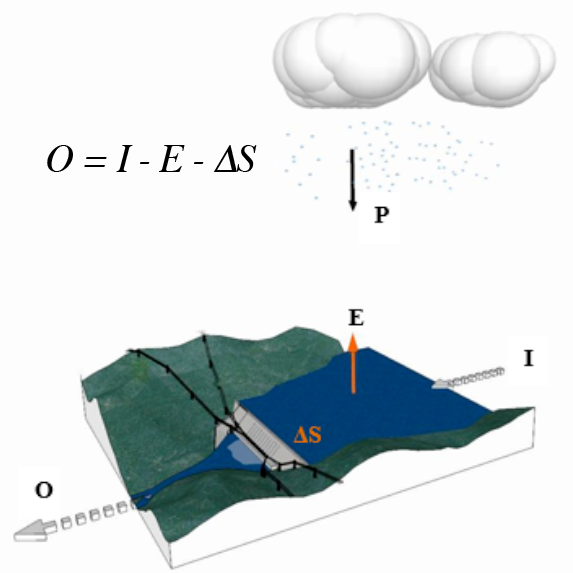 Understanding Satellite-based Monthly-to-Seasonal Reservoir Outflow Estimation as a Function of Hydrologic Controls, Water Resour. Res., 52, 4095-4115, doi: 10.1002/2015WR017830. Bonnema, M. and F. Hossain. (2017). Inferring reservoir operating patterns across the Mekong Basin using only space observations, Water Resources Research, (http://dx.doi.org/10.1002/2016WR019978). Hossain, F., M. Srinivasan and A. Andral (2017) Advancing Societal Application of the Planned Surface Water Ocean Topography (SWOT) Mission, EOS Meeting Summary, (accepted). Hossain et al. (30+ co-authors of SWOT Application Workshop) (2017) Engaging the User Community for Advancing Societal Applications of the Surface Water Ocean Topography (SWOT) mission, Bulletin of American Meteorological Society (BAMS), Meeting Report (In submission). Hossain, F. (ed.) (2016). Earth Science Satellite Applications: Current and Future Prospects Springer Remote Sensing/Photogrammetry, Switzerland, doi: 10.1007/978-3-319-33438-7_1. Durand, M., Gleason, C.J., Garambois, P.A., Bjerklie, D., Smith, L.C., Roux, H., Rodriguez, E., Bates, P.D., Pavelsky, T.M., Monnier, J., Chen, X., Di Baldassarre, G., Fiset, J-M., Flipo, N., Frasson, R.P.D., Fulton, J., Goutal, H., Hossain, F., Humphries, E., Minear, J.T., Mukolwe, M.M., Neal, J.C., Ricci, S., Sanders, B.F., Schumann, G., Schubert, J.E., and Vimlin, L. (2016). An Intercomparison of Remote Sensing River Discharge Estimation Algorithms from Measurements of River Height, Width, and Slope, Water Resour. Res., 52, 4527-4549, doi: 10.1002/2015WR018434.